The series Miscellanea is something like a diary track for Photography and Beyond - with each work, of course, reflecting the other. Miscellanea I, covering 1988-97 and in black-and-white, is strongly connected to The Holy Bunch, from which it features some unused scenes. Part five of Emigholz's architectural studies that form the film collection Photography and Beyond. 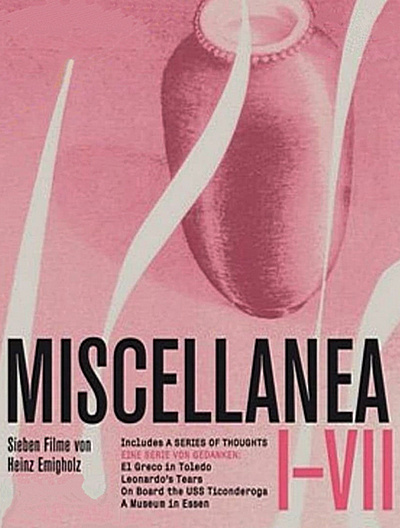 Like the series' first instalment, Miscellanea II covers 1988-97, albeit this time in colour and with a stronger focus on when Emigholz worked on Photography and Beyond's first two monographs, Sullivan’s Banks and Maillart’s Bridges. Both works are also book-ended by images shot on the same day: 11 October 1988, at Cabo de Creus. Part six of Emigholz's architectural studies that form the film collection Photography and Beyond. A meditation on ruins and remains linked strongly to the US chapters of Photography and Beyond. A rumination on a nation and dream in tatters. A cautious reminder of ever-lurking horrors: a glimpse of the warship Puglia, not far from the sarcophagus containing the mortal remains of Gabriele d'Annunzio. Part 10 of Emigholz's architectural studies that form the film collection Photography and Beyond. Three variations on the most extreme form of filial piety, not always voluntary: the son's sacrifice (by the father's hand). El Greco in Toledo (Miscellanea V) shows Emigholz trying - in many ways - to come closer to a painting; Leonardo’s Tears (Miscellanea VI) is a scratch videoesque tribute to a football player's struggle; On Board the USS Ticonderoga (Miscellanea VII) retells a photograph of men not long for this earth. A Museum in Essen (Miscellanea IV) offers the necessary cinematic space for contemplation, some distance and quiet to give the eyes a rest and let the mind roam freely.